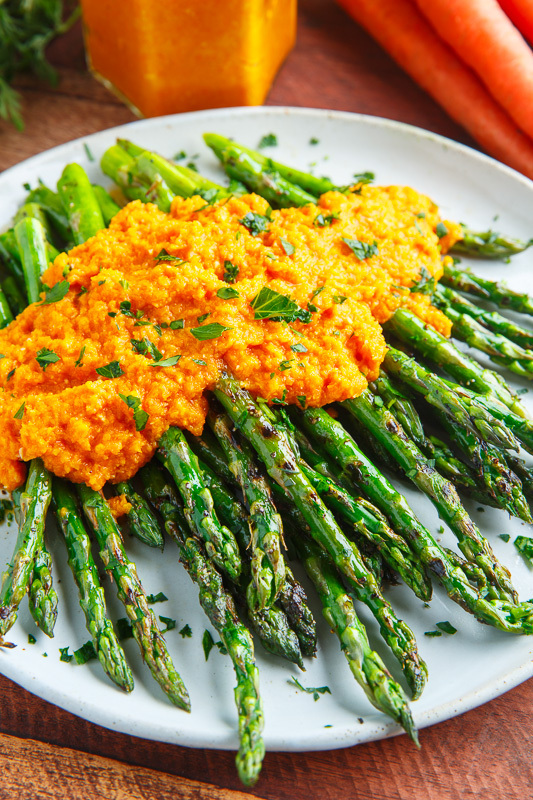 Grilled asparagus served with a tasty carrot-ginger dressing that is just packed with flavour! Are you ready for another side dish for your Easter dinner? How about this tasty grilled asparagus with carrot ginger dressing? With spring here, even though it’s still chilly here, there is asparagus from down south available and I could not resist picking some up to make this dish! This asparagus recipe is so easy, you just cook the asparagus (I like to grill it to get that slightly charred and smoky flavour) and serve it topped with the carrot-ginger dressing which is inspired by the carrot ginger dressing that you stereotypically find in Japanese restaurants. The defining characteristics of the carrot dressing are of course the carrot and ginger flavours complemented by the tangy rice vinegar and the absolutely amazing aromatics from the toasted sesame oil. 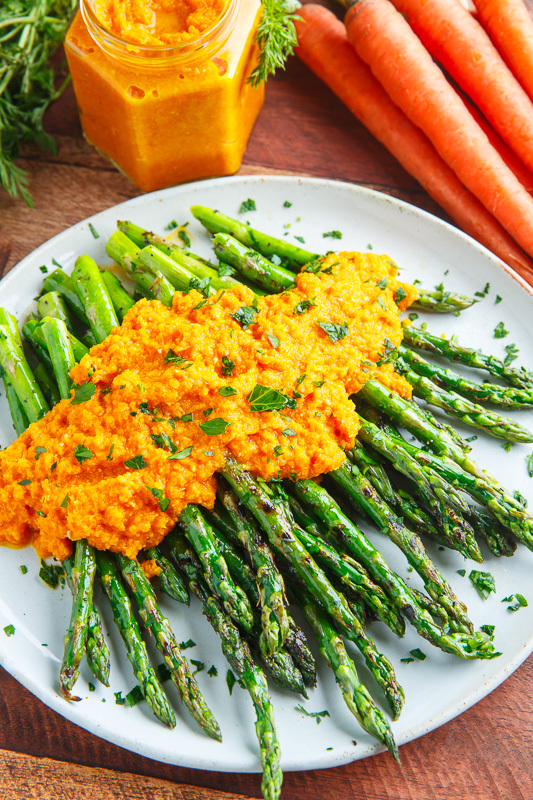 With the combination of the spring asparagus and the Easter carrots this grilled asparagus with carrot ginger dressing is a perfect side dish for your Easter dinner! I hope the Easter bunny does not get upset that we turned his carrots into a dressing! Toss the asparagus in the oil, salt and pepper and grill over medium-high heat until crisp-tender and slightly charred. Puree the remaining ingredients in a food processor or blender. 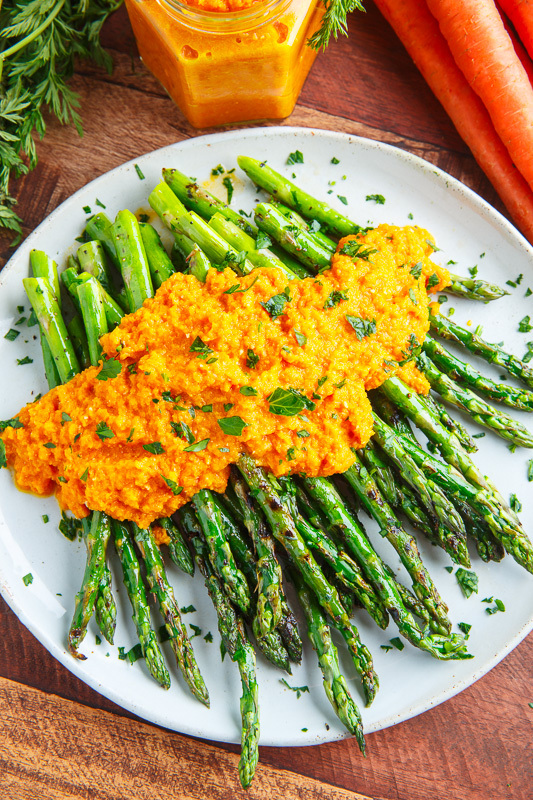 Serve the asparagus topped with the carrot ginger dressing and enjoy! Simple but looks very delicious! I'm trying to eat more healthy and more vegs, so this is definitely something I'll try. I love this spring time side dish. You just need to add a protein and you have a complete meal with this recipe.